One of the things that separates Tour players from the rest of us is that the former are intimately familiar with their games. They know how different shots will unfold regardless of where the ball is sitting, especially around the green (where difficult lies abound). Not surprisingly, that's where weekend players tend to cough up strokes. This article addresses the first — and perhaps the most important — part of the shot equation. If you can't pull off good shots from bad lies, you'll never reach your scoring goals. In my opinion, the only way to develop this skill is through experience. Pros have the advantage of unlimited practice time, but you can begin to catch up with a simple three-shot experiment that I use in my schools. Its entire purpose is to open your eyes to the various backspin outcomes that can be created by the type of lie you're facing. Once you're successful from all three lies, check the results, which should look something like what's pictured in the photo at right. What you'll notice is that the shot from the rough rolled out the farthest — the mass of grass that wedged its way between the ball and the clubface at impact killed most of the backspin. The shot from the fairway stopped short of the first, even though it landed in the same spot. That's because you generated much more backspin due to the cleaner lie. And for the teed-up third ball, which had zero grass on the clubface to interfere with contact, you created max backspin and stopped the ball almost immediately after it hit the green. Of course, you never get to tee up your wedge shots, but that's not the point. What this exercise teaches is how lie effects spin, and that controlling spin is the trick to hitting short shots close. It's an invaluable lesson. 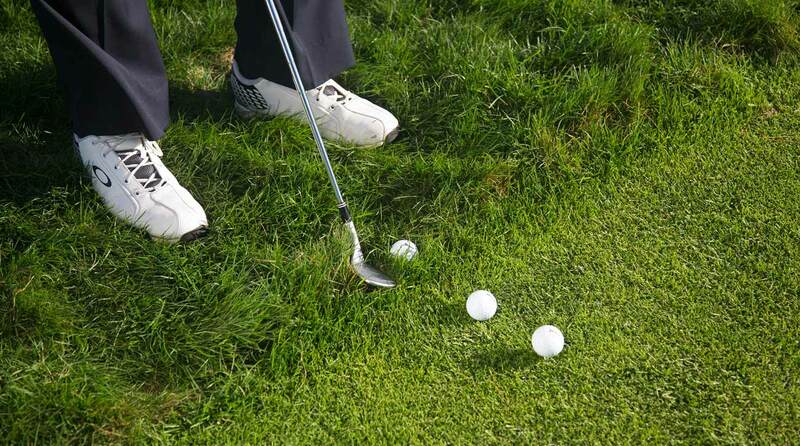 Try it from different distances using different wedges. The experience will turn you into a cagey vet in no time.